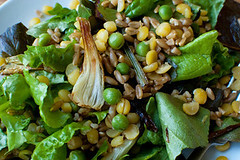 Description: MDM’s Savory Garden Risotto is MDM’s take on The Good Earth’s delicious Summer Risotto. This dish can be eaten alone or served as a side dish with baked chicken or salmon. This dish is colorful to look at, savory, and fragrant. Best of all, it is easy to make! Any grocery store will carry these ingredients, but MDM recommends going to a farmer’s market or local organic co-op for vegetables, herbs, and cheese. You can use boxed risotto, which is the fastest. Or if you have your own favorite home-made recipe, you may use this as well. Chop sweet bell peppers, zucchini, and summer squash and mix into a medium-sized bowl. Chop garlic cloves and add to frying pan with virgin olive oil. Sautè vegetables from bowl and set aside. Cook creamy parmesan risotto (per box instructions) in pot [or use own recipe for making creamy risotto]. 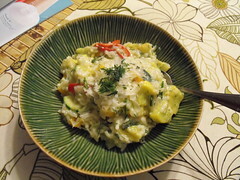 In medium-sized bowl mix risotto with sautèed vegetables. While still hot, mix in grated fresh parmigiano reggiano cheese, chopped fresh dill, and grated lemon rind. Squeeze lemon juice over dish to taste. Serve immediately. Enjoy! United Noodles Oriental Foods is the largest Chinese market in Minnesota. This market is excellent for the novice as well as the expert in Chinese cuisine. Inside you’ll find an array of cookware, tea sets, decor, rice (white, brown, black, and sweet rice), noodles (rice, pho, etc…), sauces and spices, produce, fresh seafood, frozen goods, beverages, candy, and more! Also unique is an aisle dedicated to Hawaiian goodies such as sweet potato chips, pink sea salt, coconut and tropical drinks. There is an indoor restaurant that serves delicious hot meals such as beef noodle soup, teriyaki beef, chicken curry, BBQ ribs and Pho for $7. Tea is free! Directions: Heading east on Franklin Avenue, make a left at Minnehaha. Drive straight until you see the Coastal Seafood store on East 24th Street and make a right. 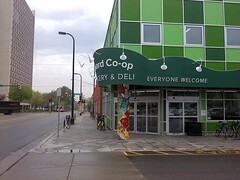 On the left side, look for the Snelling District sign and make a left into the alley.